James Patrick Kelly has had an eclectic writing career. He has written novels, short stories, essays, reviews, poetry, plays, and planetarium shows. His books include Burn (2005), Strange But Not A Stranger (2002), Think Like a Dinosaur and Other Stories (1997), Wildlife (1994), Heroines (1990), Look Into The Sun (1989), Freedom Beach (1986), and Planet of Whispers (1984). His fiction has been translated into sixteen languages. He has won the Hugo Award twice: in 1996, for his novelette "Think Like A Dinosaur" and in 2000, for his novelette, "1016 to 1." He writes a column on the Internet for Asimov's Science Fiction Magazine and is on the faculty of the Stonecoast Creative Writing MFA Program at the University of Southern Maine. In 2004 he was appointed by the Governor of New Hampshire to be the Chair of the New Hampshire State Council on the Arts. Victoria McManus: Why do you write science fiction? When did you first connect with other genre writers, and how did that help or not help you? 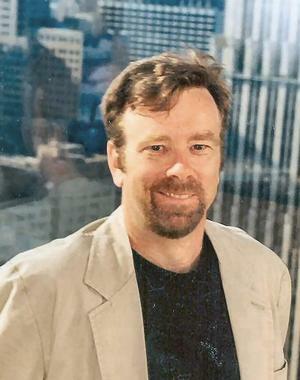 James Patrick Kelly: When I began writing, I tried everything on for size: mysteries, SF, fantasy, mainstream—I even tried writing for the confessional magazines—a market which has long since atrophied. But I was most comfortable writing SF. I liked stretching my imagination until it showed me things about myself and the world that surprised me. SF is a kind of writing which can be unflinchingly intellectual and yet chock-a-block full of the wildest sort of adventure and the most outlandish characters. I went to Clarion twice and met writers whose influences can still be seen in my work—instructors like Damon Knight, Kate Wilhelm, Joe Haldeman, and Thomas Disch and fellow students like Bruce Sterling, Eileen Gunn, Leslie What, and Cynthia Felice. This may come as a surprise to recent acquaintances but I was a shy boy when I first started out; one of the things that attracted me to the field was the sense of community. I was very much taken with the idea that SF was in some sense a common enterprise that many writers participated in. I've always thought that while it was important to do my best work, it was almost as important to help make sure that the best and most artistically ambitious writers in our genre be read and recognized. If SF is known primarily for its hackwork, then we've lost our way. VM: You've been a mentor to many, many writers, either directly, through workshops like Clarion, or indirectly, through your articles, such as "Murder Your Darlings." Whom do you think of as your own mentors? JPK: Although I owe a lot to my Clarion instructors, especially Damon and Kate, I'm not sure I can count them as mentors. When I consider my most important influences, I turn to my colleagues. If unfortunate English majors are someday assigned to write scholarly JPK papers, they would do well to familiarize themselves with John Kessel, Connie Willis, Karen Joy Fowler, and Bruce Sterling, to name but four of my contemporaries whom I read closely. Not quite of my generation but also friends and serious influences are Jonathan Lethem and Kelly Link. In a very real sense, the workshops that I have participated in with these master writers have stood in the place of mentors throughout my career. VM: Do you continue to workshop your own stories? JPK: I do. Just about everything you've read of mine has been through some damn workshop or other, most recently the Sycamore Hill and Rio Hondo national workshops or else my local workshop—one of the best anywhere—the Cambridge Science Fiction Writers' Workshop. VM: Who is your ideal reader? JPK: Since I aim stories at so many different audiences, from bull geeks to third graders, my ideal reader would have to be someone with extremely eclectic tastes. I'm hoping that, like me, she hasn't quite made up her mind about what's important in life, but has formed some educated opinions. I write so that we can think these things through together. On the other hand, if she voted for George Bush, we need to talk. VM: What draws you to write short fiction? Is there a particular story you feel is the best of all your work? What about that story makes it best? Was it the process of writing it, the result, or a combination of several factors? JPK: Clearly short stories must be more energetic and efficient than novels. They flit across the page and the reader's imagination and yet the best of them can leave as profound an impression as any bug-crusher of a novel. I have quite resigned myself at this point in my career to accepting that my obit will start with something like "This was the guy who wrote 'Think Like A Dinosaur,'" although I would argue that it's neither the best of all my work—although damn close—nor my personal favorite. I think my story "Undone" is my most ambitious story, and was probably the most fun to write. "1016 to 1" is my most personal story. Although not exactly autobiographical, I did burn off a lot of childhood memories getting it on the page. Of my most recent stuff, I'm still very fond of "Men Are Trouble"; it has some of the best sentences I've ever written. I have a story coming up in Asimov's called "The Leila Torn Show" which will be the most quirky entry in my bibliography and that pleases me very much indeed. I must confess, alas, that I'm a happy writer when it comes to the daily grind of putting words on the screen. I am often amused by what I write and at the end of the day am usually convinced that what I have done deserves not only publication but accolades. It's usually only after a story comes out and finds—or loses—its way in the world that I am able to get any critical distance from it. VM: Do you think the science fiction short story is essential to the genre's future? Why or why not? How do you think new formats for short fiction, such as electronic publication and podcasting, will help or hinder future SF short fiction markets? Does science fiction have a future? JPK: If the short story ever disappears from the genre, then science fiction will be irretrievably broken, in my opinion. However, I don't necessarily believe that my opinion is written into the fabric of the universe. I do think that fiction in general and short fiction in particular is being challenged by other forms of storytelling: film, audioplays, games, and graphic novels and by changes in the method of distribution. As the changeover in distribution from dead trees to digital plays out over the next ten years, I expect that our little genre will look to some observers as if it is dead, dying or irrelevant. But when everything shakes out, I expect there will still be writers writing and readers reading short SF. The greatest strength and weakness of fiction writing is that it is done by sole practitioners. Creative writing is one of the most democratic and inclusive arts; you don't need a studio to write a short story. On the other hand, some of the other collaborative storytelling arts are much more immersive and short story writers will almost certainly lose audience share to them. VM: Do you plan to write more radio plays, perhaps for podcasting? How is the process of writing a play different from writing a story or novel? JPK: I would love to write more audioplays. Wait a minute—is this thing on? [taps microphone] Now hear this! If you can produce audioplays, Jim will write you one for practically nothing. Call him now! But having worked with the professionals at Seeing Ear Theater, I know better than to try to homebrew a podcast audioplay. That's why I've taken to podcasting my fiction instead. However, as I write this, my first full-length stage play has just finished its first tour: I've written a handful of one acts, all of which have been produced, but this is the Real Thing. It's an alternate history play in two acts called "The Duel." Act One is a rock solid retelling of the events leading up to the duel in 1804 between Alexander Hamilton and Aaron Burr, except at the end of the act, the duel has a different outcome. Act Two takes place six years later in a world where, as a result of the Act One twist, New England has seceded from the United States and formed the Northern Confederation. I think plays are much more like short stories than they are like novels. Once again, energy and efficiency rule. For this playwright, the biggest difficulty is getting background information in without narration. It's not only that you need to give your characters reasons to talk about backstory, which, as you know Bob, can be awkward, but also that after every scene change you somehow have to re-establish time and place. However, the thrill of audioplays and stageplays for this sole practitioner is in the collaboration. I very much enjoy working with other people, especially when they know what they're doing! VM: You've told me that your new novel from Tachyon Press, Burn , is available in weekly podcasts. Did you have podcasting in mind when you wrote the novel, or did you think of it later? What makes Burn so suited to being read aloud? Have you received any feedback from listeners, or is it too soon? JPK: I started recording stories on cassette tape and giving them away as presents way back in the mid 'eighties. I am a big fan of spoken word fiction and do the greater part of my pleasure "reading" by listening to books from Audible.com. I began posting readings of my stuff on my Free Reads page in February, 2004 and when podcasting came along I jumped on the bandwagon. I didn't think of podcasting Burn until I was almost finished writing it, in part because I wasn't sure my publisher Jacob Weisman at Tachyon Publications would let me. But I was able to make a case for the podcast, in part because I could point to the success of my pal Cory Doctorow, who has released his novels for downloading, and in part because I was able to convince Jacob that the podcast was not necessarily in direct competition with the print version and in fact might bring in readers who might otherwise never know about the book. I think the experiment has been a success, but it's still probably too soon to know exactly what effect it's had on sales of Burn . But numbers for the podcast have climbed steadily: early on I was getting maybe a thousand hits a day and now it's well past two thousand and I still haven't finished the reading. I'm thinking that some folks are waiting until the whole book gets posted before they start listening. VM: Tell me more about Burn . JPK: Burn represents a return to traditional SF values, it says here. It's a novel about a would-be Utopian colony on a distant planet in the far future. The colony is based on the teachings of Henry David Thoreau, which is one of the reasons why it's doomed to failure. Although ultimately it isn't the most important part of the book, Burn takes a critical look at some of Thoreau's Luddite tendencies. More central to the book is a meditation on terrorism. The utopian Walden colony is pushing the existing human culture on its world to the margins, and the indigenous people fight back by setting forest fires. Lest potential readers think that Burn is nothing but a preachy intellectual tract, I should say that there is quite a bit in it for adventure fans. For example, it's the only SF novel I know about forest fire fighting. One of my favorite chapters in it takes place at a townball game, which is the sport that eventually became baseball. And there is a lot of humor in the book. At least I think there is. When I read certain chapters in public, people do laugh. I think that has something to do with the popularity of the podcast. Possibly the best review I have ever had in my life was when Faren Miller wrote in Locus that " Burn combines maturity with the adventurous spirit of youth, as though the Mark Twain of Huckelberry Finn had come back with a yen to write science fiction." Yow! When Jacob Weisman approached me about the possibility of writing a 25,000-30,000 word novella for a new series at Tachyon, it had been more than ten years since publication of my last novel, Wildlife . I don't know why my career has turned out that way exactly, but it occurred to me that if I could write a longish novella, I might be able to psych myself up to return to the novel project I've been at on and off—mostly off, obviously—for the last couple of years. But the more I wrote of Burn , with its tight focus on one world, Walden, and one character, Prosper Leung, the more I started to wonder about the rest of the Thousand Worlds I had had created as part of the backstory. Once I decided to bring a delegation of oddball characters from the Thousand Worlds to Walden to bug my poor protagonist, Burn started to get bigger. And bigger. And then it was overdue. And then it was way overdue. But Jacob was patient, bless him, and when I finally finished a draft and put it through the Cambridge Science Fiction workshop (thanks, my friends!) and made the fixes they asked for, the thing was just 500 words short of 40,000 words. In the eyes of SFWA, I had come within a hair of committing a novel! But Burn is officially still a novella. In fact, I've just sent the contract back to Gardner Dozois, who has taken it for The Year's Best Science Fiction, Twenty-third Annual Collection . VM: You collaborated with John Kessel on the novel Freedom Beach . How did the collaboration begin? Did you work in sequence, or simultaneously? Would you collaborate again? If so, what might you do differently? JPK: We did a little of both. You have to understand that we were both pretty new when we wrote Freedom Beach and were by no means selling everything we wrote. So we hit upon a scheme of writing stories that were homages to some of our favorite writers, which were designed to fit into the framework we had devised for the novel. Some of these stories were published under our own names. But the connecting frame we passed back and forth over time and then the two of us got together for a week in Connecticut to interview agents in New York—since neither of us was represented at the time—and to bash out the rest of the frame story pretty much using the hot typewriter . . . er . . . keyboard method. When I got up, he sat down to type. John and I collaborated twice after Freedom Beach , both times with Jonathan Lethem. One of our triple collaborations, "Ninety Percent of Everything," was an F&SF cover story and a Nebula finalist. John, Jonathan, and I have discussed an idea for another collaboration, although when, if ever, we'll find the time to do it remains to be seen. And that's the problem—or at least, my problem—with collaborations: finding the time. VM: What basic writing advice do you find yourself giving again and again? JPK: To writers who aspire to be published in our genre—or any genre for that matter—I urge them to read the stuff. I'm always astonished at newbies who tell me that they're sending stories off regularly to Asimov's or Strange Horizons and then confess that they have never read these 'zines. They're laboring under the misapprehension that they're smarter than SF's groupmind and are thus unaware that their Adam-and-Eve story or their robot girlfriend story has already been told eight gajillion times. Not that you can't still write an Adam-and-Eve story ("Undone") or a robot girlfriend story ("Bernardo's House") but you have to write one that's different . I have recently begun teaching at the low residency Stonecoast Creative Writing MFA program at the University of Southern Maine (Want an advanced degree in skiffy? Mars needs MFAs!) and I would say that the problem that makes most unpublished stories unpublishable is that they don't pay enough attention to the reader. Too often writers are trying to paint with sentences instead of telling the damn story, or else they clot their prose with narrative lumps, or else they natter on about trivia they picked up on their vacation to Scotland or South Dakota. Writers who write for themselves only usually end up with an audience of one, in my experience. One of the values of a workshop is that astute readers get to take their just revenge on selfish or oblivious writers. Victoria McManus majored in Classical and Near Eastern Archaeology and completed her Master's in Anthropology, both extremely useful for writing SF and fantasy. Her nonfiction includes author interviews for Strange Horizons , and she is reviews editor for The Broadsheet . She currently serves on the jury for the Andre Norton Award.